The following recipe shows one easy way to mitigate your significant other’s resistance by letting them control the Shion system as well (without co-opting your own computer). Shion’s user interface is designed so that any user can walk up to it and begin controlling devices. While are certainly further improvements to make it even easier to use (and we are working on those), one problem that still remains is how to turn an interface that permits only one user at a time (in economic terms, rivalrous) into one that can be used by multiple users (e.g. one’s spouse) simultaneously. If your spouse is also a Mac user, follow these steps to share with them control of your Shion system. Step 1: On a working Shion system (one connected to a powerline controller), go to the Shion preferences and select the Sharing tab. 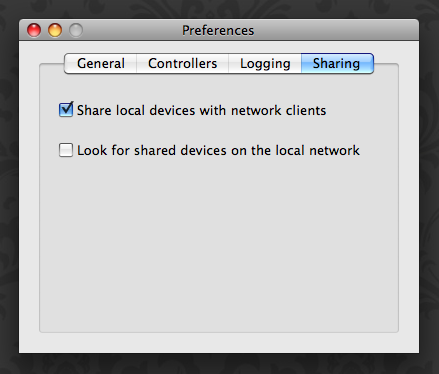 Step 2: Click the Share local devices... checkbox to turn your instance of Shion into a local server. Step 3: On your spouse’s machine, install a fresh copy of Shion. Feel free to also install your license file to remove the 3 device limit. Step 4: Launch Shion on your spouse’s computer. Go to the sharing preferences as you did in the first step. Select the Look for shared devices... checkbox. Step 5: In the main device window, your (non-controller) devices should appear in the list. Select any of them and use the interface to test that you can control your environment remotely. The snapshots should work as well. New devices cannot be added from your spouse’s computer. New snapshots cannot be created from your spouse’s computer. I believe that you will find that your spouse’s resistance to you augmenting your house with new switches, plugin modules, and other automated hardware will diminish as they get the hang of using the system themselves. With some luck (and the right spouse), you may find that they insist that you add more automation to your home when they discover that they can’t control some ransom device that you have yet to connect to Shion.